Problems activating or registering Recuva Professional? 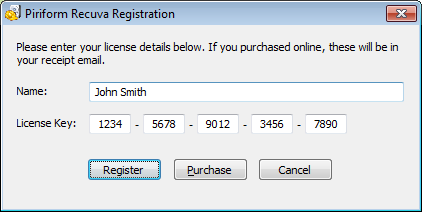 The first time you run Recuva Professional, you will need to register your product by entering your Name and License. This information will have been included in the email you were sent after you purchased. You will need to enter this information exactly as it appears in your registration email. We recommend that you cut and paste these from the email, as this is much easier. Once you have entered the registration details press the Register button to activate your copy of Recuva Professional.